Push | Sonny's BBQ Rebrand and Restaurant Design. For low-priced, all-you-can-eat BBQ, Sonny’s had been the go-to restaurant for a generation of diners since 1968. But while AUVs were trending steady, the brand was not growing guest count—especially among millennials who saw it as their grandparents’ BBQ joint, not their own. Push developed a contemporary interpretation of the iconic Pitmaster to showcase their, and the brand’s, mastery of the art of BBQ. And with new visions for everything from menus to uniforms to entire restaurants to a complete re-brand of all marketing materials, we affected every team member and consumer touchpoint from back-of-house to front. To regain the position as the leader in BBQ, we moved the focus from price and product onto the men and women who spend hours perfecting their craft, showcasing their accomplishments both in the smoker and on the plate. 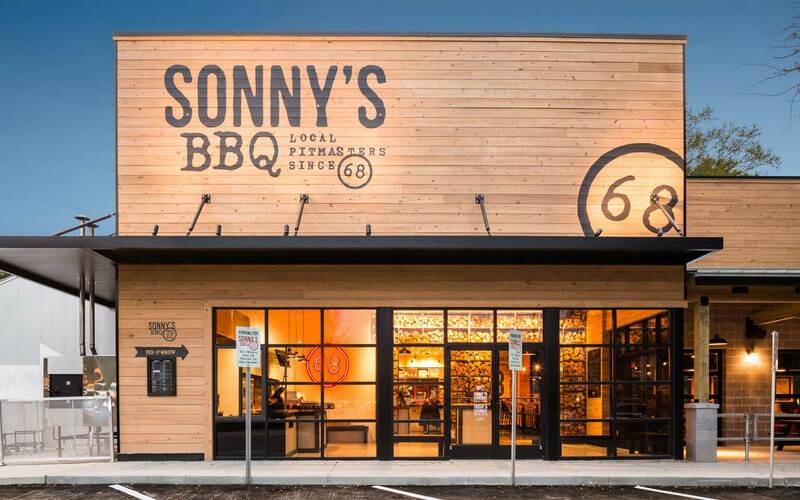 The Pitmaster became a metonym for the new Sonny’s brand. At the center of any Pitmaster’s universe is the smoker. Older restaurants had the smoker out back, hidden away. For all remodels and new restaurants, we brought the smoker to the forefront, giving Sonny’s instant credibility for authentic BBQ that guests can smell and see being smoked, chopped, sliced and pulled. We found the value that people are looking for isn’t only in pricing, but in the authenticity of preparation. That means we spend an incredible amount of time perfecting things like food photography. We know natural light is ideal to showing the “imperfections” of BBQ…imperfections that make BBQ so great-looking and great-tasting. Ensuring Sonny’s guests are able to find locations, menus and limited-time offers on every possible platform is key to the brand’s digital presence. As over 65% of digital users are getting to SonnysBBQ.com through a mobile device, we built a mobile-first platform as the foundation for a holistic digital strategy. BBQ fans are eager to learn all they can about the latest BBQ news, recipes and competitions. That’s why Sonny’s created its own national invitational contest—Smokin’ Showdown. While the event is held in Florida, we use social media to connect with fans all over the country with real-time marketing supported by video, photography, community engagement, Facebook Live and other social platforms. Borrowing from the concept of Random Acts of Kindness, Sonny’s BBQ developed Random Acts of BBQ. This outreach program allows Sonny’s team members and guests to nominate unsung community heroes who selflessly make the world a better place. We activate this cause through social media and document its impact using our content studio to capture the events and the effect they have on people. Push recognizes there are two audiences for any brand—those who are its consumers and those who deliver on its promise day in and day out. Working with Sonny’s HR department, we engaged everyone from the corporate office to the front- and back-of-house with the new brand, so they could then act as stewards of it when dealing with guests.